The office staffers extremely nice! However the doctor was difficult to understand and made me feel like he didn’t valuemy input. Overall it wasn’t horrible, I would rate they overall experience as a 6/10. The office staffers extremely nice! However the doctor was difficult to understand and made me feel like he didn’t value my input. Overall it wasn’t horrible, I would rate they overallexperience as a 6/10. 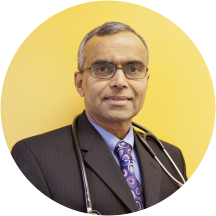 Originally from India, Dr. Shah is a Board-Certified Allergist who is proud to serve Old Bridge, Seagirt, Brick, and Bayville, NJ and the surrounding communities. Dr. Shah specializes in Allergy testing, Asthma testing, and Immunotherapy workups, as well as a variety of other visit reasons in a comfortable and welcoming environment. He attends professional conferences and special continuing-education trainings a couple times each year, and strives to dedicate time to diagnosing and helping each individual patient. In his free time, Dr. Shah works to volunteer at his temple and at medical camps, and enjoys reading and golf. Dr. Shah is a member of the New Jersey Allergy, Asthma, and Immunology Society and the American College of Allergy, Asthma, and Immunology. He was amazing. I brought my baby along and he was very warm to him as well. An A+ provider. Dr. Shah is very professional as well as very personable. A treatment was immediately put into place and i look forward to my progress as I will be going back in a week. I believe that my allergy issues will be resolved in a timely manner. The office staff was so pleasant and knowledgeable. Dr Shah was kind , attentive and very understanding. I highly recommend this office! I was very pleased with the Staff and Dr. Shah. He listened to all of my concerns and very patient with me. He is very kind and informative. Staff was courteous and polite. I barely had a wait. I highly recommend Dr. Shah. Staff was extremly courteous and helpful! I got to the doctors office an hour early and was seen 1/2 hour before my scheduled appointment. What a welcome releif. Doctor was very courteous, knowledgable and professional. The only negative Isee is there is no online patient portal to look at and download progress notes, labs and other testing. Very thorough. His entire staff was extremely friendly. The staff was very welcoming and made my visit great! Doctor Shah made sure to ask question about what I was going through and listened! Dr. Shah is the best! He and his office staff are so friendly and accommodating. Thank you. Parking is a NIGHTMARE! Very small waiting room but super nice staff! Dr. Shah was very personable and professional. He took his time during the appointment to listen to my concerns and was empathetic and knowledgeable. Would definitely recommend. Great doctor! Very informative and a great sense of humor. The office staff was doing their best to be accommodating, but they were overwhelmed with the number of patients they had to attend to! That was why they misplaced my chart and called patients who had appointments after me to be seen before me! I was impressed with Dr. Shah the first time we met. I have made a follow up appointment next week and look forward to his ideas for helping me cope with my asthma. He was wonderful. He had fantastic bedside manner and his nurse was awesome. I was super comfortable with them and thought they were very professional and knowledgable. Nurse abrupt and surly. Reception staff and doctor pleasant. Very nice, caring doctor. His staff is very nice and welcoming. Very kind office staff. Dr Shah is very personable. Seems quite knowledgeable. Very friendly staff and he is a very nice doctor. I would highly recommend him. Took his time, very thoughtful and seemed to not draw conclusions too quickly. was not dismissive like most doctors. Very pleased with his care! I will return! He was very sweet and thorough, he was able to find all of my allergies and also tested my breating and I found that I have asthma . I am very thankful for his discovery and treatment. He is very personable. He took the time to listen to me, and asskeds questions regarding my health history.Both he and hios staff were professional and made me feel very comfortable with th is visit. I highly recommend him, and willbe returning myself! It was also great to have my forms available on line and had them ready when I got to thew doctor's office! Great time saver! Excellent service , Dr. And staff were very helpful and attentive. Would definitely recommend. My visit today was great. The staff were all very friendly and made a very anxious prone person comfortable with the allergy tests. Being able to make my appointment online was a HUGE bonus!